Far Cry 3 Machete. Influenced from the game Far Cry 3. Made by Scorpion Swords & Knives from Quality Heat Treated Steel. See Pictures, Prices, and Descriptions. 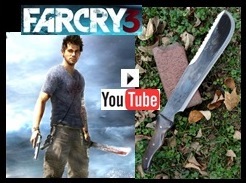 This Machete is Influenced from the Game Far Cry 3. The machete was originally developed in Southeast Asia, where they remain very popular today. Specifically noted for being the pattern the British Army used for its British Special Forces. Great for cutting thick vegetation without getting stuck in the chopping material.